Stowaways have been discovered on our unicycle tour. Apparently they stowed away when I left Costa Rica and have been with me ever since. The immigrants managed to make it through numerous border patrol check points without detection during the ride. Once I discovered them I had a good mind to turn them in to the INS, but it appears the CDC is more interested in them. They go by the name of Leishmania Panamensis. Apparently it is a complicated and protracted extradition process to deport them. On the advice of experts I have indefinitely postponed the tour and I am headed back home to begin the process of deportation. I want to thank all my followers and supporters for encouraging me so much along the way. I am determined not to let the little buggers stop me from finishing my trip, but the prudent thing to do at this time is to get the medical attention I need. I plan to pick up where I left off when the opportunity and conditions make it possible. Unfortunately resuming the trip at a latter date will not give the same satisfaction of crossing the country in one continuous trip, but will actually require more resolve. There is also no way I will pick up in the same awesome shape I was in when I left off, so in some ways it will be a more difficult feat. I hope this delay does not deter people from supporting my cause to raise funds and awareness for research for ALS. 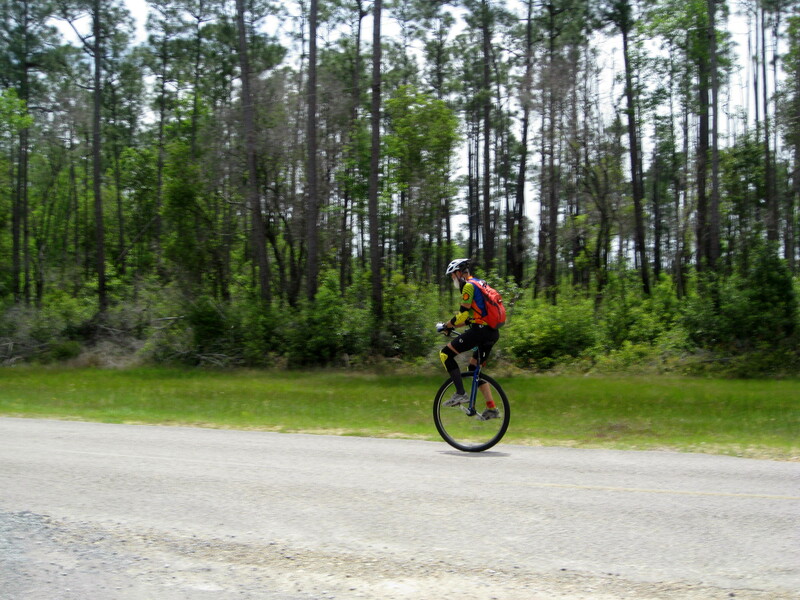 Please tune in again for Stage two of my great unicycle tour across the country when the trip resumes. Dave , I am so sorry but your health is far more important than the cause. Did you get bitten by sandflies or is this some kind of excuse to get back for the sailing season?? I was bitten by a sand fly. Not sure if treatments will cut into sailing season. Boo hiss! What a bummer! Have a safe journey home and a very thorough recovery. We look forward to stage two. Sorry for the bad luck Dave. What a let down as you were hitting the home stretch. When I rode my motorcycle down through South America 2 years ago,I didn’t even take a swim suit, fearing meeting the little buggers. I did befriend some bed bugs in Argentina though.Good luck with the recovery. Thanks for your thoughts. Even though they are called sand flies it is more likely we met in the jungle. So sorry to hear of your problem. You accomplished, what we think is the impossible, already. Dennis and I had planned on being at your finish line….we will just postpone our arrival also! Take care, speedy recovery! Thanks for your support, I was looking forward to seeing you again. Hi David. Hope you feel better soon and make a speedy recovery. We are so proud of all that you have accomplished and really enjoyed reading the tales. I have no doubt that in the future we will be following you again. Take care! Dave, you have accomplished an amazing feat! I look forward to your complete recovery and finishing YOUR ride. I agree with Eric. The determination to go back and complete your journey will bring you a lot of satisfaction. We’re looking forward to following you again. Mend well. now what the heck am I gonna read? You really can’t come up with a better plot twist. Of all the perils and possible things that would abort this ride a SAND FLY was not even on the radar. I’ll be looking forward to picking up the saga when you are well. Sorry for you Dave! Hope you can get back on the road soon. Take care! Thanks for all your support. I had a great time in Costa Rica with all you guys. Hope we can paddle together again some time. I am currently receiving treatment at the Cleveland Clinic. Not sure when I will resume my trip. I’m not up on my “unicyclese” but would you consider this a UPD? I know that with your determination,you’ll be up and riding ASAP Heal fast. Dave, thank you so much from all of us at ALS TDI for embarking on this crazy journey. We have enjoyed reading your updates and look forward to Part Two of the tour when the time comes. Rest up and get well soon! Sorry to hear you have to take a healing break on your tour. We’ve been following you on and off throughout your journey. We hope you can get the bug under control quickly. Looked up that bug, sounds very nasty. Take care, Dave, I’ve been following the blogs and I’m definitely looking forward to the 2nd leg of the cross country tour. Rachel and I completed our ride it St Augustine Beach on May 23rd. We were looking forward to seeing you along the route as we were both inspired when you met you in Louisiana. You seemed to be traveling 8-10 mph which I wouldn’t have thought was humanly possible. Congratulations on your incredible effort and I look forward to your full recovery and completion of your full journey. Rachel’s blog of ride is at freeasbirds142.wordpress.com if you want to check it out. Congratulations on completing your great adventure. Thanks for your support. I am not sure but we may have been very close on my last day of riding. You were on the same stretch of road on your May 12 post that I was riding on my last day which was May 12th. I did not post my last day until May 15th. We must have just missed seeing each other again that day. I rode over 60 miles that day at an average riding speed of 12.7 mph. Wow! Your unicycle speed is impressive. 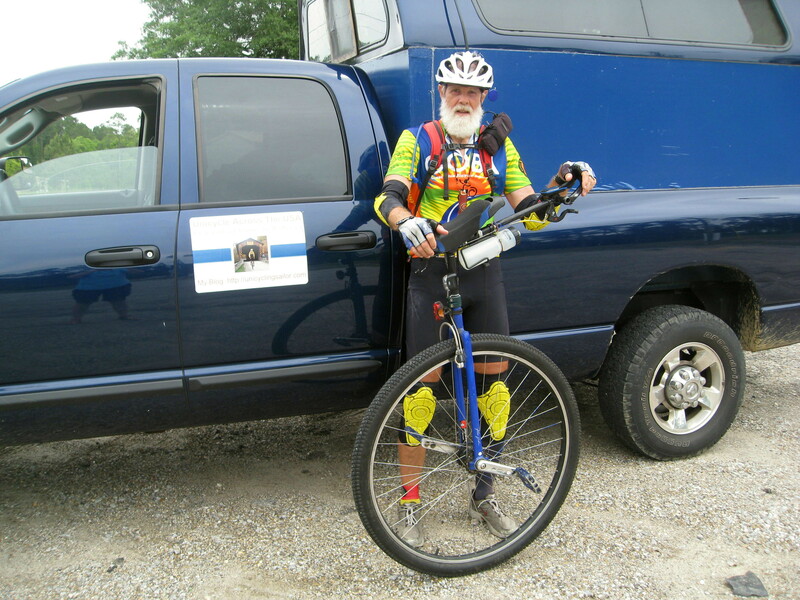 On May 12th we started at 7 AM from Crossroads, MS (6 miles west of Bogalusa) and stopped 12 miles west of Van Cleave at about 1 PM. We must have just missed you.